Claypot Kung Bao Boozy Frog Legs. Kung Bao also transcribed as Gong Pao or Kung Po, is a spicy stir-fry Chinese dish made with chicken, peanuts, vegetables, and chilli peppers. This is a classic dish in Szechuan cuisine originated in the Szechuan province of south-western China and includes Szechuan peppercorns. Although the Kung Pao dishes is found throughout China, there are regional variations that are typically less spicy than the Szechuan style. My ex-mother-in-law is from the Kangxi district and there the food is normally quite spicy. 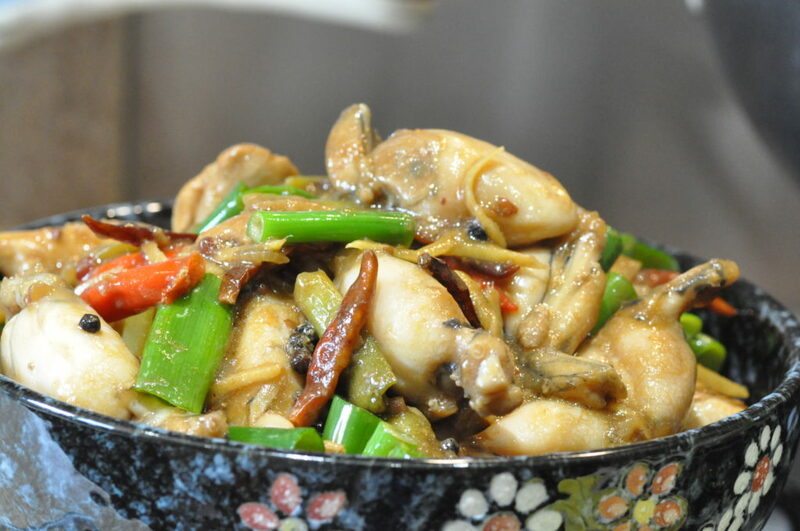 Kung Pao chicken is also a staple of westernised Chinese cuisine. 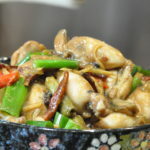 In this dish I am using frog legs because I want to prove to my hubby that frog legs taste like chicken but much nicer. 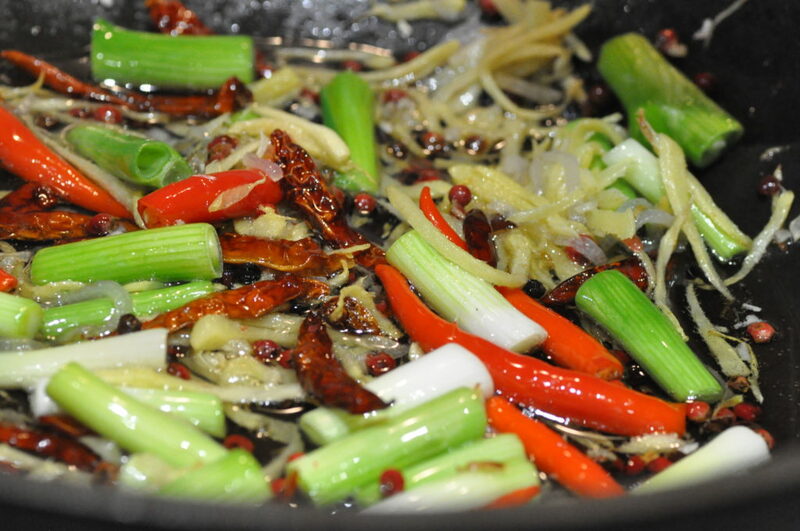 In a hot pan with 2 tbsp of oil fry mince garlic, julienne ginger, white of spring onions, dried chillies, fresh red birds eyes chillies and Szechuan peppercorn. Season with soy sauce, rice wine, sesame oil and add in a cup of water mix with the cornflour. 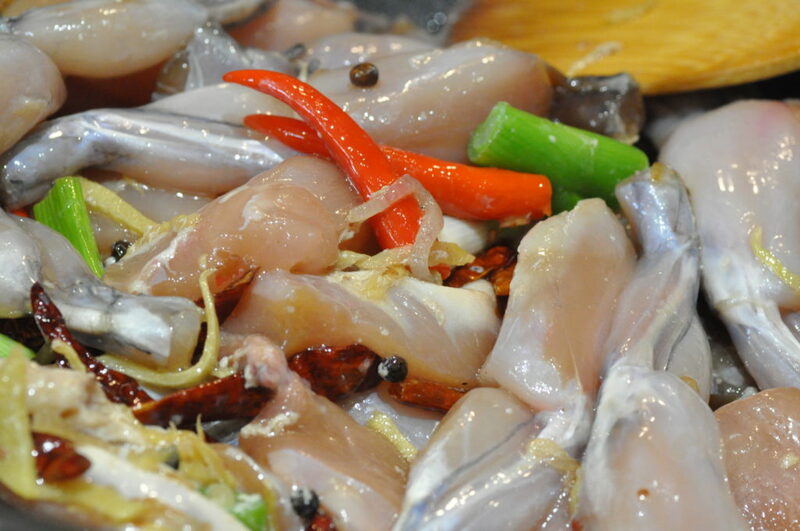 Cover and let it cook for 10 to 15 minutes. Top with green of spring onions before serving. Season with salt and pepper. Note – I like to fry the ginger first and then save some for decorations. I did not make any chilli oil for this dish because I do not want it to be too spicy as I had a guest for dinner. Note – Please add cashew nuts if you prefer.